Welcome to our " BEST OF BEST DREAM 11 " FOR '' ENGLAND WOMEN VS SOUTH-AFRICA WOMEN ONE DAYMATCH, dream 11team FOR II match in ONE DAY SERIES. 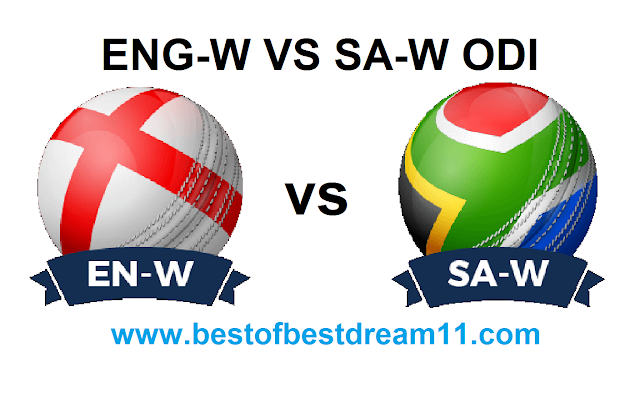 Here is best ENG-W VS SA-W dream 11 team for the fantasy user who are looking to make a strong team for maximum win.We are providing latest news ,match update,information about the match. The team is picked by using various factor on the basis of performance .ground stats and latest form. 1-Protest women registered their first win since 2003 on ENGLAND. 2-Last match K BRUNTS unbeaten 72 of 98 balls helped ENGLAND ,who were once 64-6,to good score 189. 3-SA-W EASILY achieve the target with the help of LIZELLE LEES 92* RUN and D VAN NIEKERK 58 RUN. 4-IN FIRST ODI England's top order was blown away by S ISMAIL(3 WICKET) and A KHAKA (3 WICKET). In this blog we will provide best dream 11 team for free so that you can make huge profit in dream 11.